A field of red tulips stands strong on green stems. 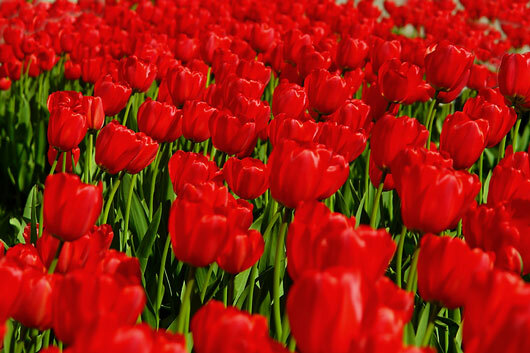 While a single red tulip can make a statement, an entire field of red flowers is particularly stunning. The beautiful red flowers inspire thoughts of nature, spring, and love. Their vibrant color educes feelings of happiness. While tulips reached the height of their popularity in the 17th century, many of today's gardeners still consider them an integral flower in their gardens. However, tulips are not for the faint of heart. While they are beautiful, they are very hard work. Because tulips don't thrive when left in the ground, they must be lifted after they die back in order to survive. They then must be cleaned, dried, and stored in a cool place over the summer. Because of the hard work involved, many people choose to purchase new stock each autumn. Tulips are relatively hardy, and will do well in most any type of soil, as long as it is well drained. Tulips thrive best in full sun, but one must be careful that the flowers, particularly the taller varieties, are also shielded from the wind. Tulips can be planted with other tulips for a dramatic look, but can also be combined with other flowers. In addition to being planted in beds, tulips can also be planted in containers. Because there are so many hybrids of tulips, the genus is split into these divisions: single early tulips, triumph tulips, Darwin hybrids, single late tulips, lily-flowered tulips, fringed tulips, Viridiflora tulips, Rembrandt tulips, parrot tulips, double late tulips, Kaufmanniana tulips, Fosteriana tulips, Greigii tulips, and other tulips that fall into a miscellaneous division.